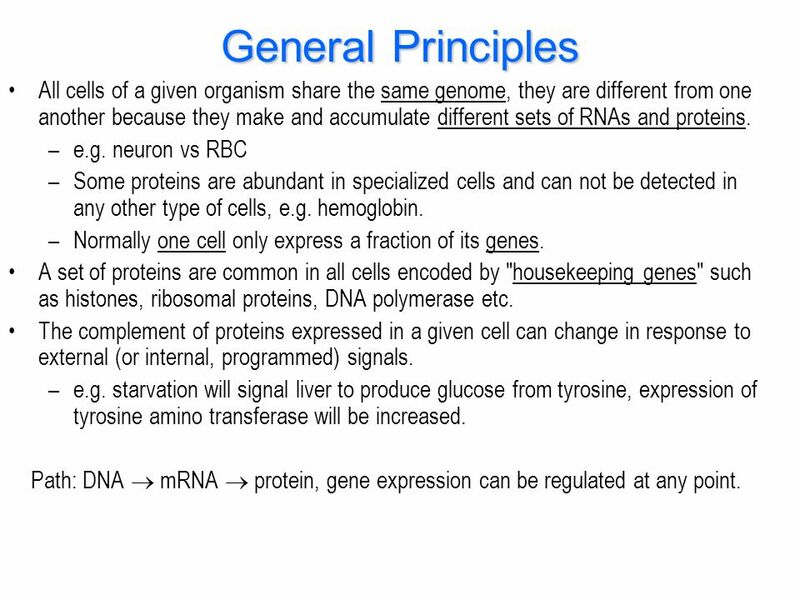 2 General Principles All cells of a given organism share the same genome, they are different from one another because they make and accumulate different sets of RNAs and proteins. e.g. neuron vs RBC Some proteins are abundant in specialized cells and can not be detected in any other type of cells, e.g. hemoglobin. Normally one cell only express a fraction of its genes. A set of proteins are common in all cells encoded by "housekeeping genes" such as histones, ribosomal proteins, DNA polymerase etc. The complement of proteins expressed in a given cell can change in response to external (or internal, programmed) signals. e.g. starvation will signal liver to produce glucose from tyrosine, expression of tyrosine amino transferase will be increased. 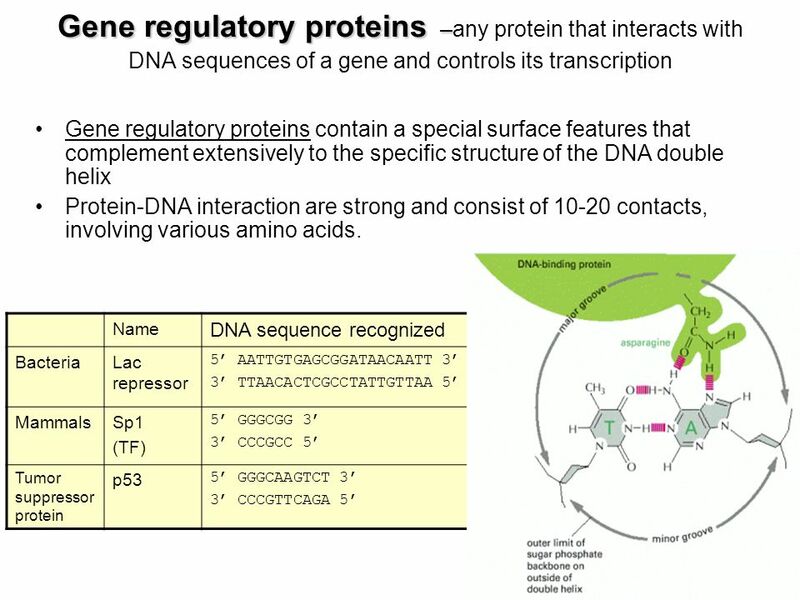 Path: DNA  mRNA  protein, gene expression can be regulated at any point. 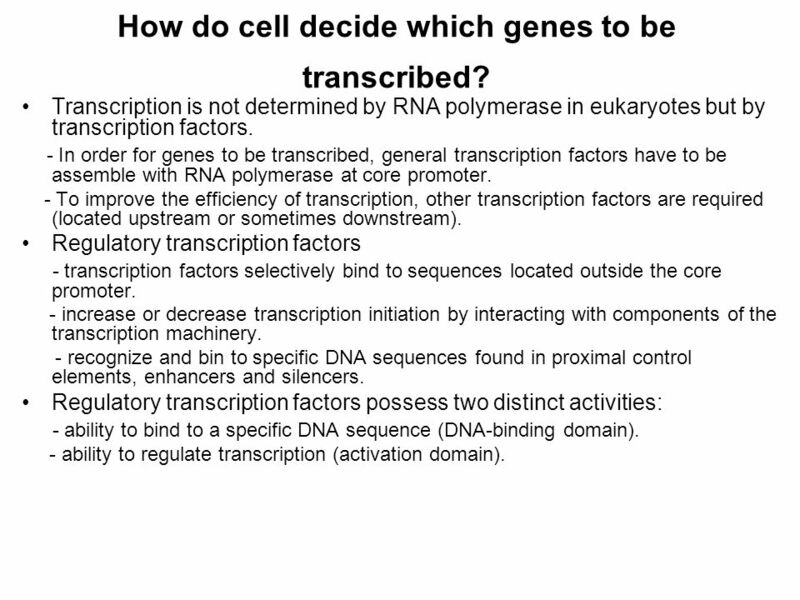 4 How do cell decide which genes to be transcribed? Transcription is not determined by RNA polymerase in eukaryotes but by transcription factors. - In order for genes to be transcribed, general transcription factors have to be assemble with RNA polymerase at core promoter. 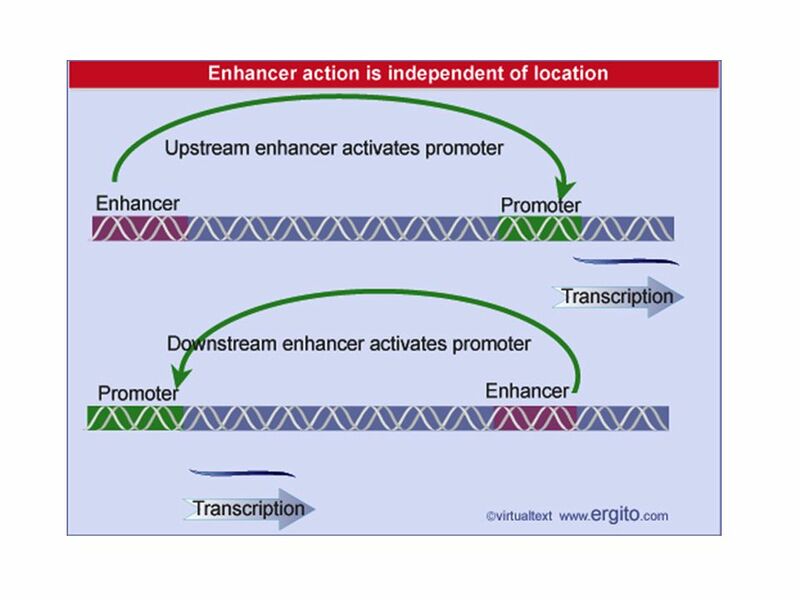 - To improve the efficiency of transcription, other transcription factors are required (located upstream or sometimes downstream). 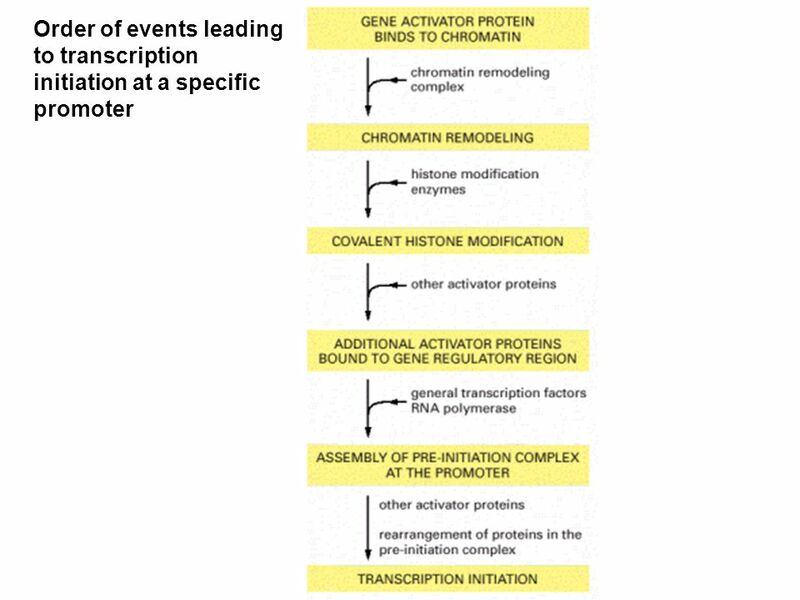 Regulatory transcription factors - transcription factors selectively bind to sequences located outside the core promoter. 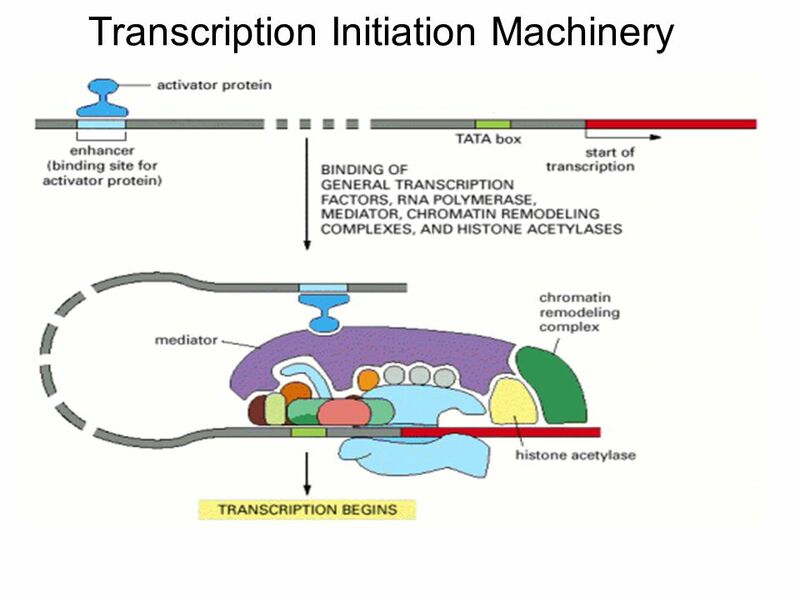 - increase or decrease transcription initiation by interacting with components of the transcription machinery. - recognize and bin to specific DNA sequences found in proximal control elements, enhancers and silencers. 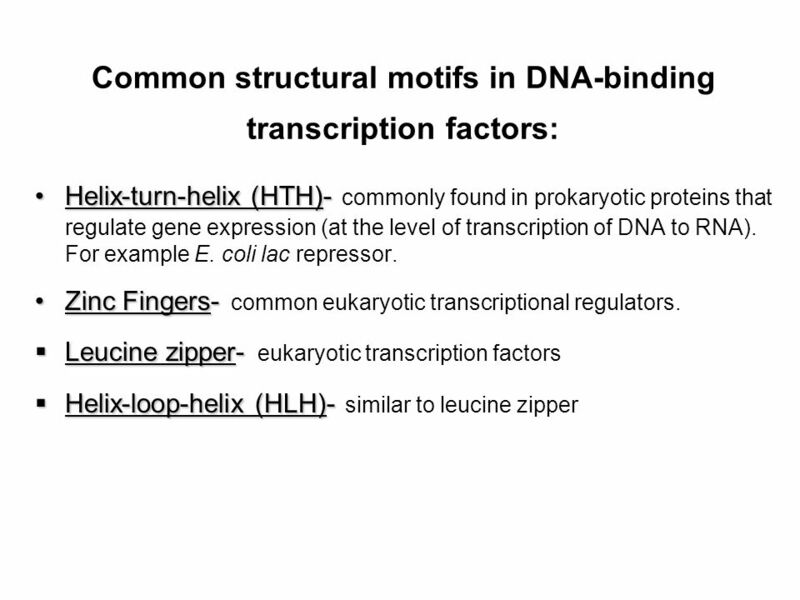 Regulatory transcription factors possess two distinct activities: - ability to bind to a specific DNA sequence (DNA-binding domain). 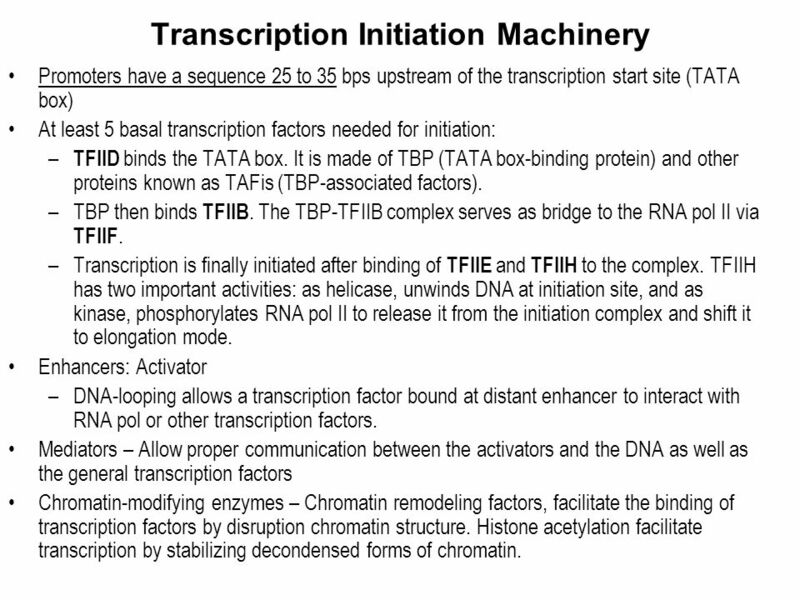 - ability to regulate transcription (activation domain). 6 Gene regulatory proteins –any protein that interacts with DNA sequences of a gene and controls its transcription Gene regulatory proteins contain a special surface features that complement extensively to the specific structure of the DNA double helix Protein-DNA interaction are strong and consist of contacts, involving various amino acids. Name DNA sequence recognized Bacteria Lac repressor 5’ AATTGTGAGCGGATAACAATT 3’ 3’ TTAACACTCGCCTATTGTTAA 5’ Mammals Sp1 (TF) 5’ GGGCGG 3’ 3’ CCCGCC 5’ Tumor suppressor protein p53 5’ GGGCAAGTCT 3’ 3’ CCCGTTCAGA 5’ Any protein that interacts with DNA sequences of a gene and controls its transcription. 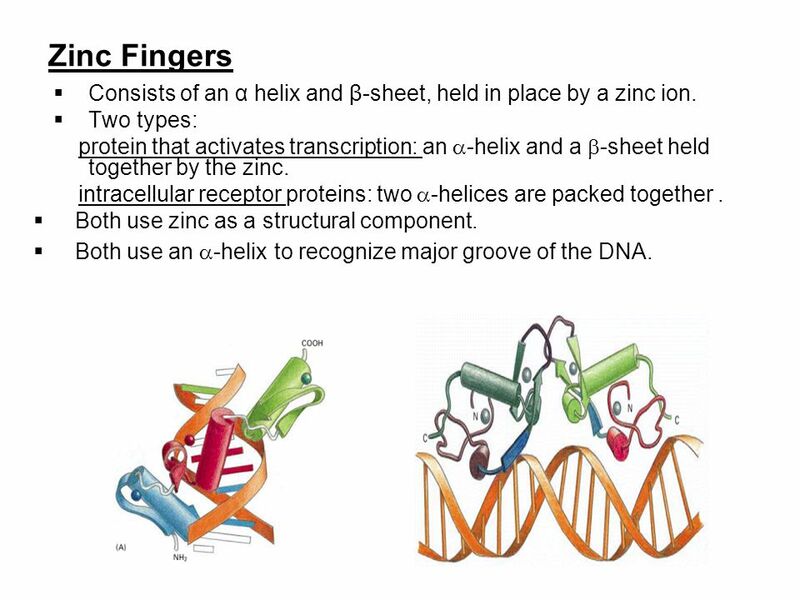 9 Zinc Fingers Consists of an α helix and β-sheet, held in place by a zinc ion. 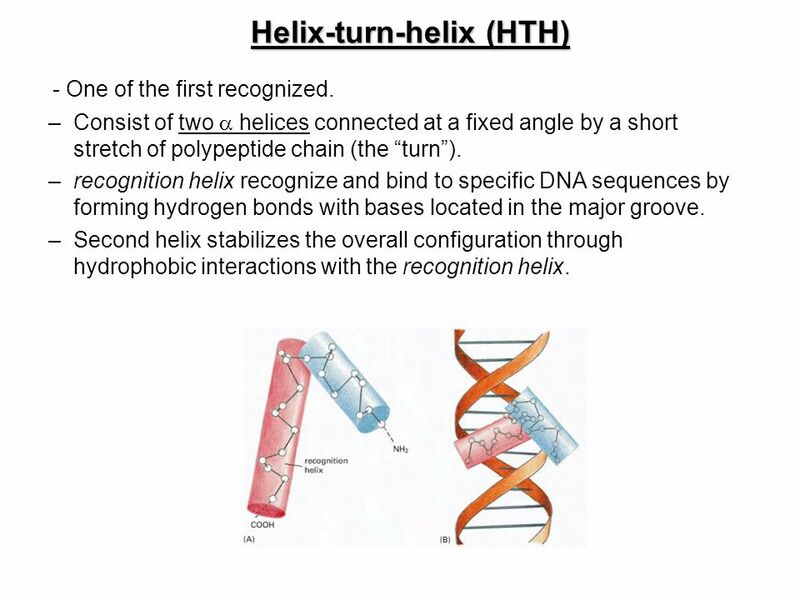 Two types: protein that activates transcription: an -helix and a -sheet held together by the zinc. intracellular receptor proteins: two -helices are packed together . Both use zinc as a structural component. 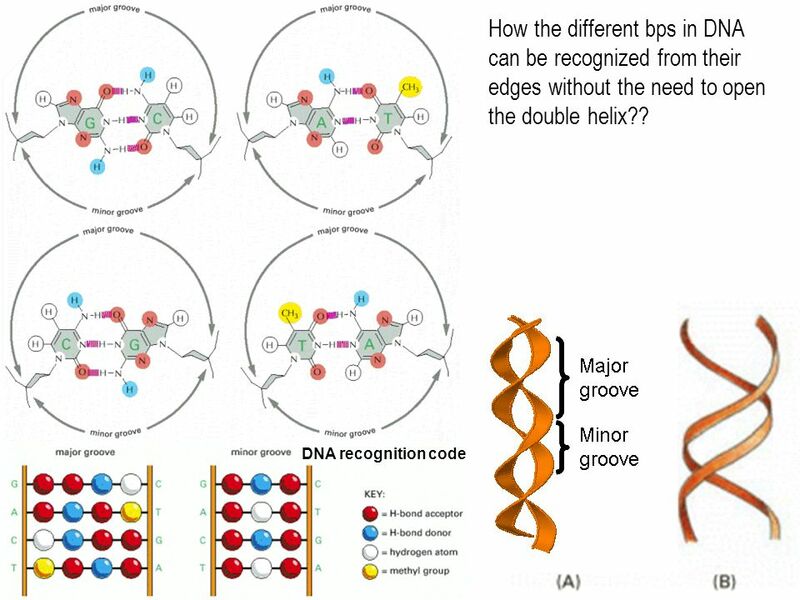 Both use an -helix to recognize major groove of the DNA. 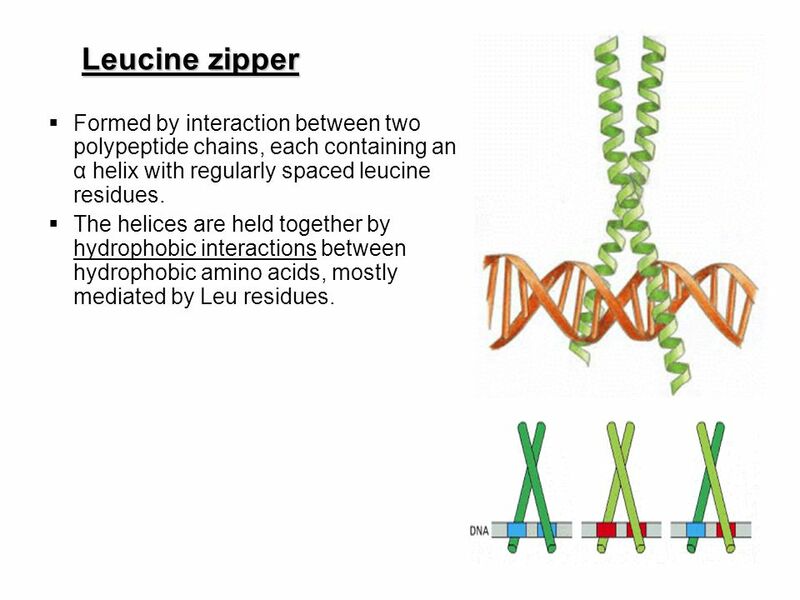 10 Leucine zipper Formed by interaction between two polypeptide chains, each containing an α helix with regularly spaced leucine residues. The helices are held together by hydrophobic interactions between hydrophobic amino acids, mostly mediated by Leu residues. 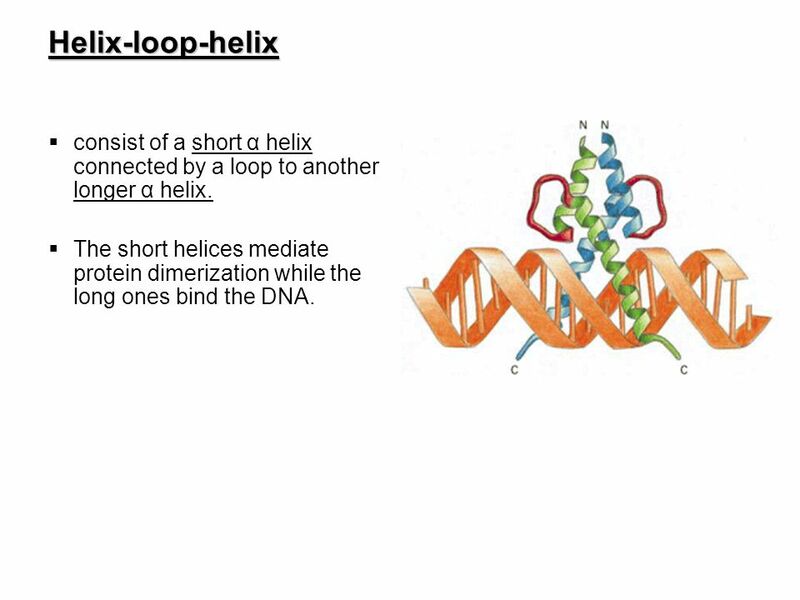 11 Helix-loop-helix consist of a short α helix connected by a loop to another longer α helix. The short helices mediate protein dimerization while the long ones bind the DNA. 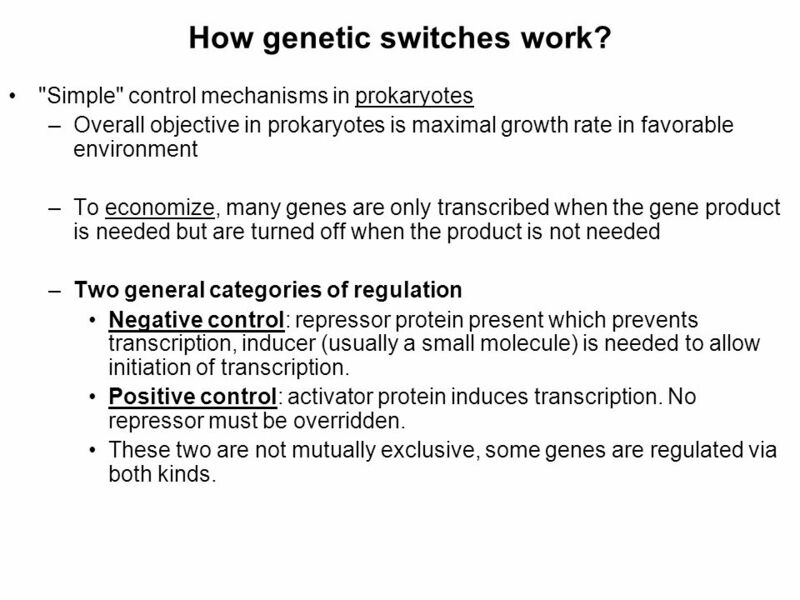 12 How genetic switches work? "Simple" control mechanisms in prokaryotes Overall objective in prokaryotes is maximal growth rate in favorable environment To economize, many genes are only transcribed when the gene product is needed but are turned off when the product is not needed Two general categories of regulation Negative control: repressor protein present which prevents transcription, inducer (usually a small molecule) is needed to allow initiation of transcription. Positive control: activator protein induces transcription. No repressor must be overridden. These two are not mutually exclusive, some genes are regulated via both kinds. 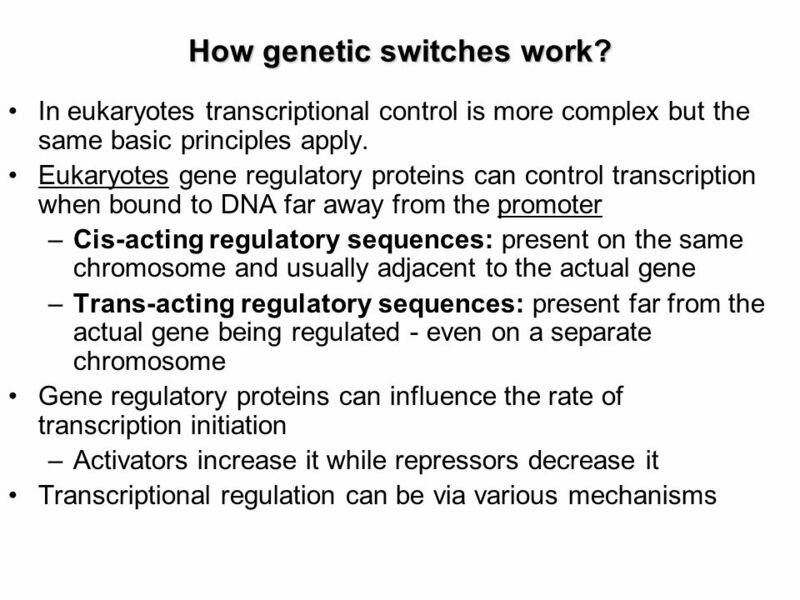 14 How genetic switches work? proposes that a relatively small number of different DNA control elements and transcription factors acting in different combinations, can establish highly specific and precisely controlled patterns of gene expression in different cell types. 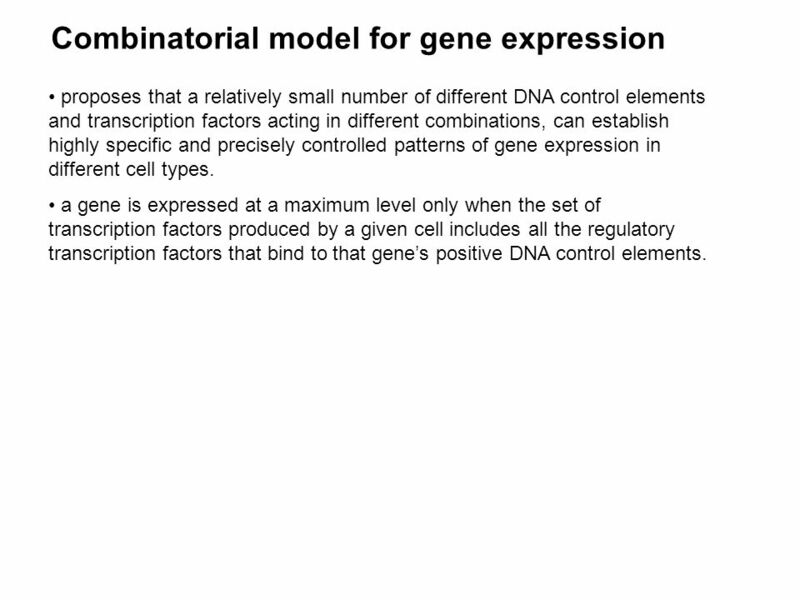 a gene is expressed at a maximum level only when the set of transcription factors produced by a given cell includes all the regulatory transcription factors that bind to that gene’s positive DNA control elements. - is the addition of methyl groups to selected cytosine bases in DNA. - tend to cluster where promoter sequences are located. - associated with inactive regions of the genome. 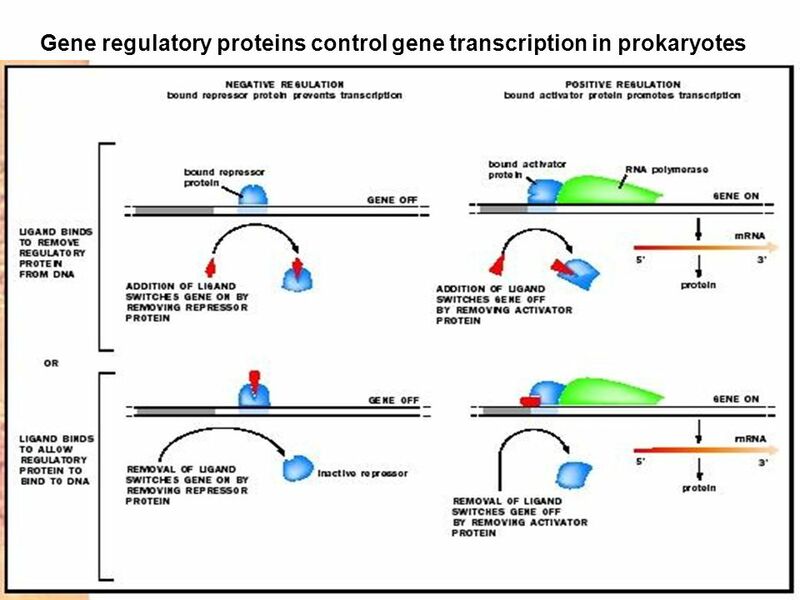 Methylation of promoter regions: - block access of proteins required for transcriptional activation. - serve as a binding site for proteins that condense chromatin into inactive configurations. 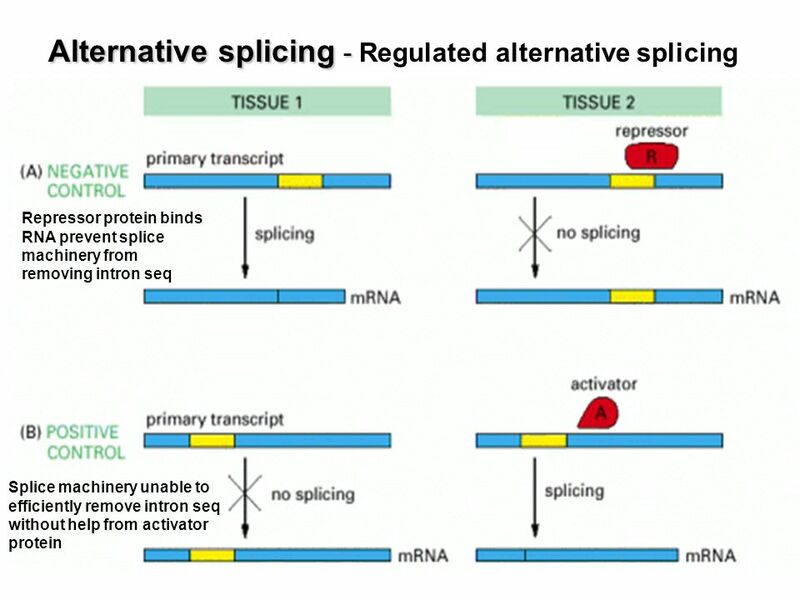 → localized or regional silencing of gene expression. 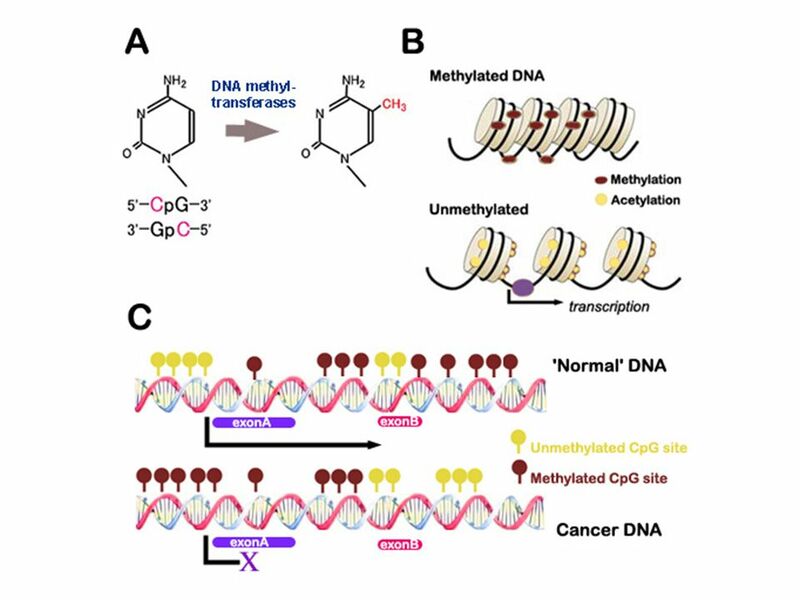 DNA methylation enzyme (maintenance methyltransferase) acts preferentially on cytosines located in 5’-CG-3’ sequences that are base paired to complementary 3’-GC-5’ sequences that already methylated. → DNA methylation can be inherited during successive rounds of DNA replication. Methylated form of cytosine is 5-methylcytosine. 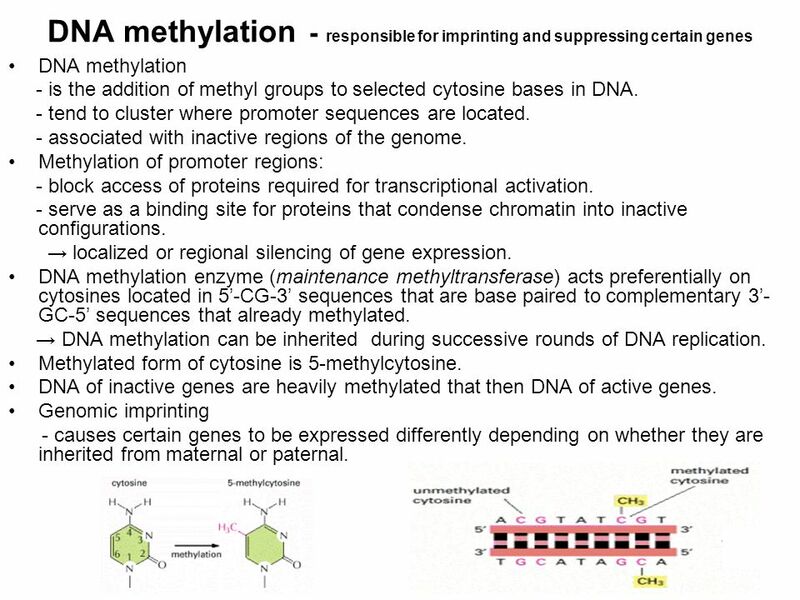 DNA of inactive genes are heavily methylated that then DNA of active genes. Genomic imprinting - causes certain genes to be expressed differently depending on whether they are inherited from maternal or paternal. poly A addition – whether an antibody molecule is secreted or remains membrane-bound. 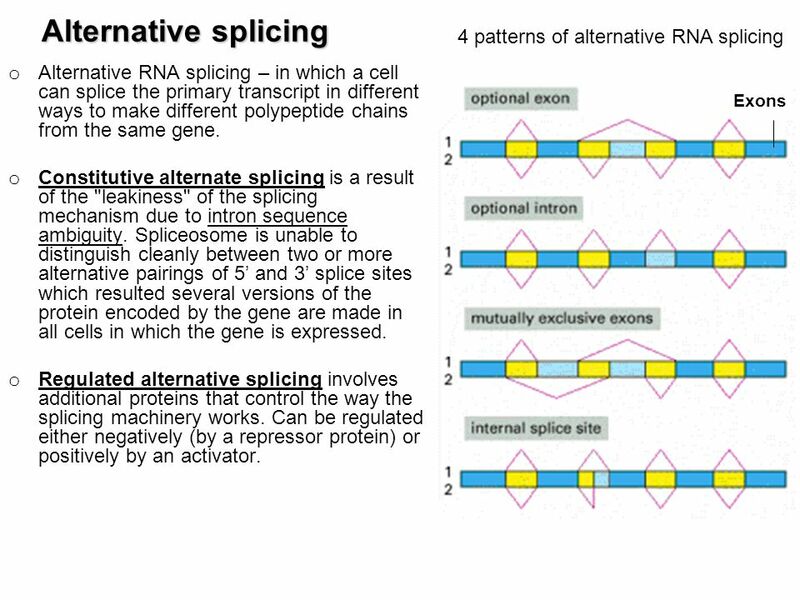 The sequence of an RNA is changed after being transcribed. → individual bases are either inserted, deleted or changed. Two mechanisms: i) site-specific deamination of adenines or cytosines ii) guide RNA-directed uridine insertion or deletion Deamination of cytosine and adenine produce uracil and inosine respectively. Mammalian apolipoprotein-B gene has several exons. A particular CAA codon is targeted for editing in which the cytosine gets deaminated and is converted to uracil in intestinal cells. 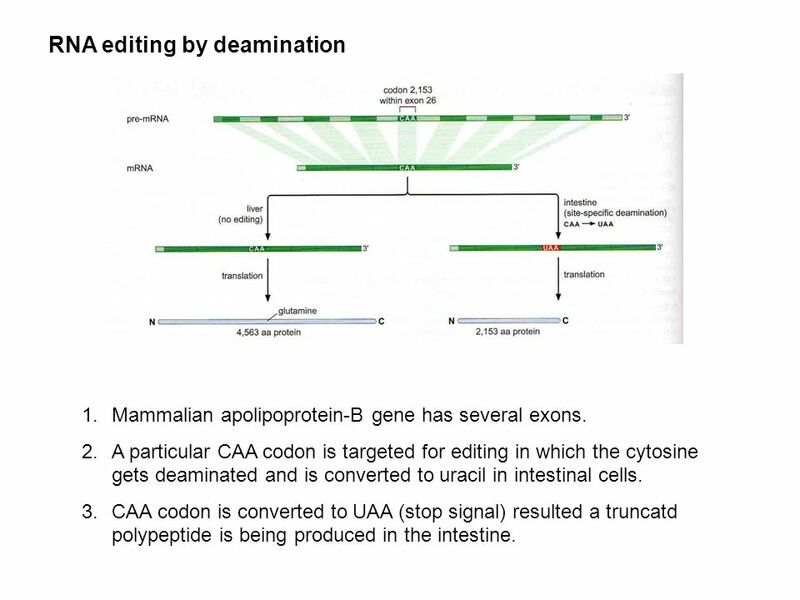 CAA codon is converted to UAA (stop signal) resulted a truncatd polypeptide is being produced in the intestine. 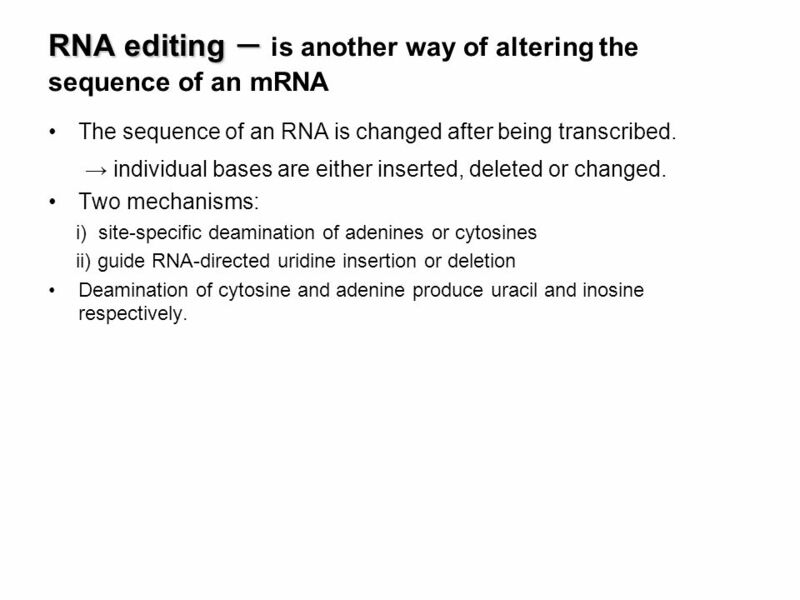 Shows the positions of the 4 U nts inserted into the pre-mRNA. 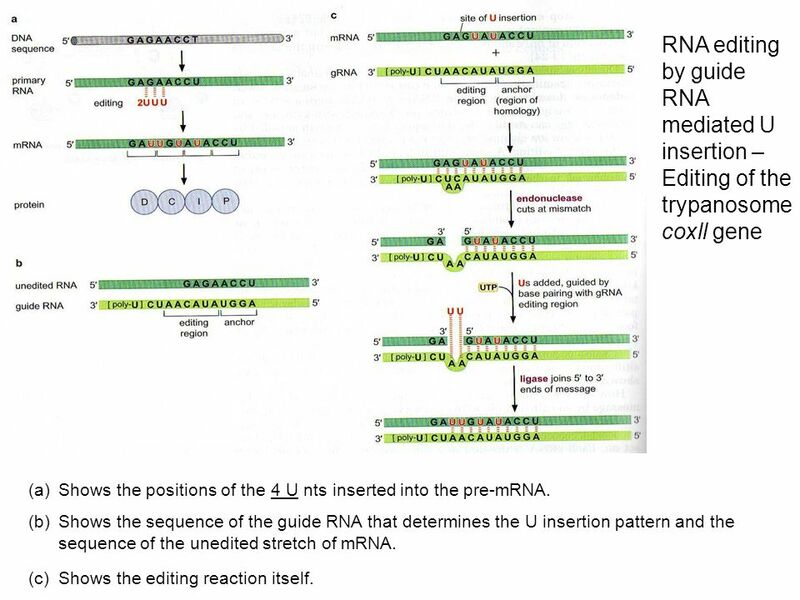 Shows the sequence of the guide RNA that determines the U insertion pattern and the sequence of the unedited stretch of mRNA. Shows the editing reaction itself. 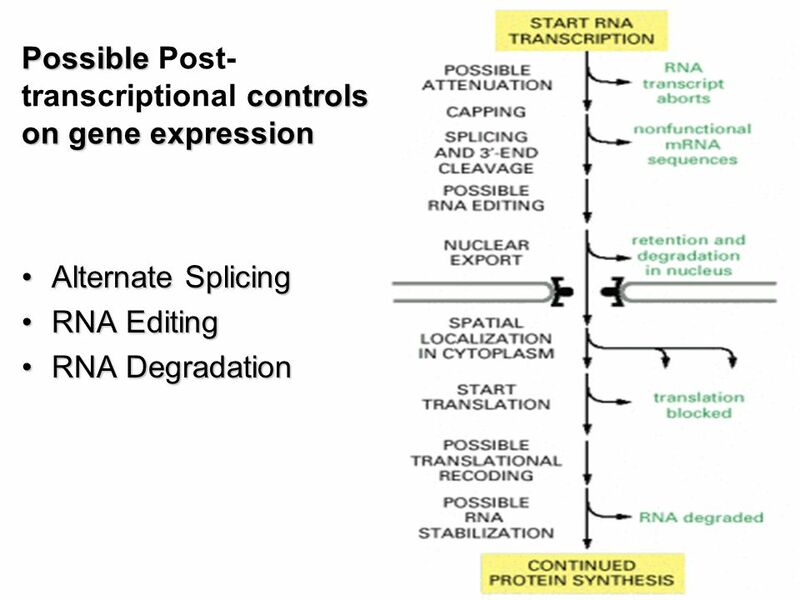 33 RNA degradation Gene expression can be controlled by a change in mRNA stability. 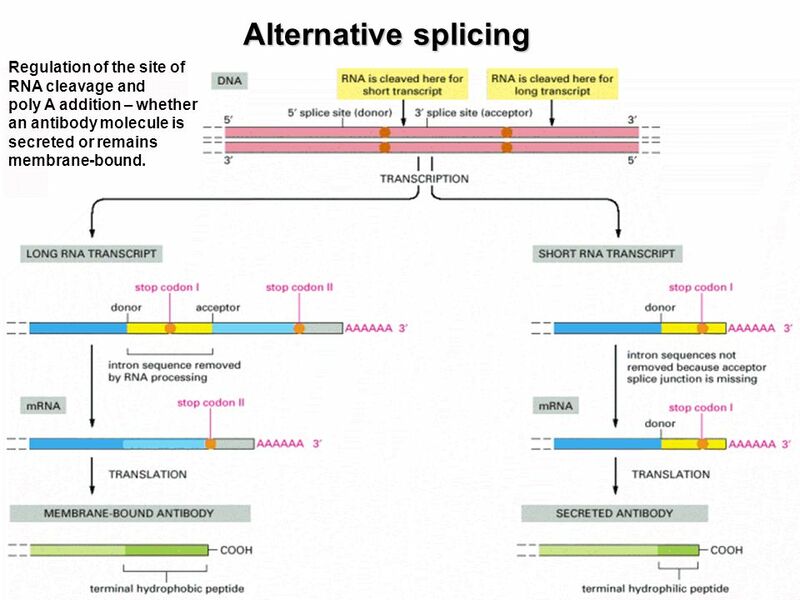 → if an mRNA molecule is degraded rapidly, less time is available for it to be translated. Half-lives of eukaryotic mRNAs vary from 30min or less to 10hr. mRNA stability is influenced by - length of polyA tail. → mRNA with short polyA tails tend to be less stable than mRNA with longer polyA tails. - AU-rich sequence in 3’UTR → AU-rich sequence triggers removal of polyA tail by degradative enzymes. Two mechanisms for degrading mRNAs the poly-A tails (which average about 200 As in length) are gradually shortened by an exonuclease that chews away the tail in the 3’ to 5’ direction. 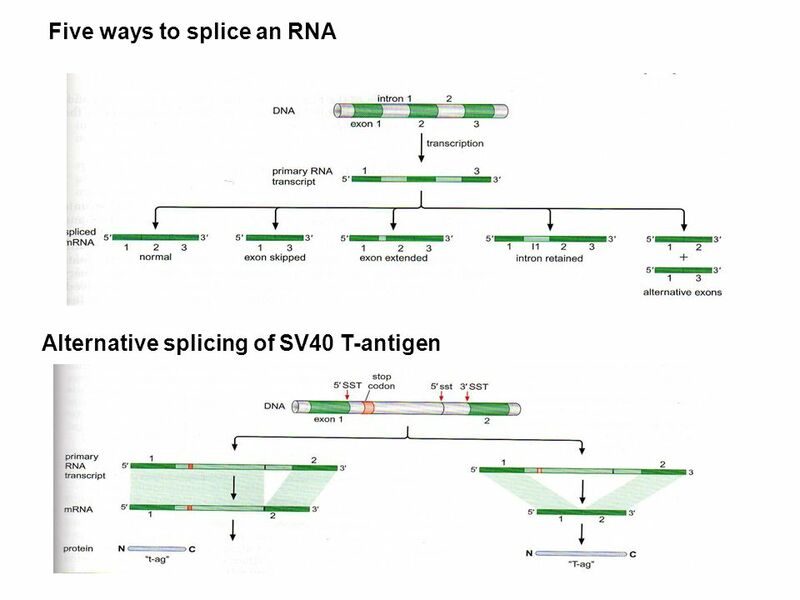 Once a critical threshold of tail shortening has been reached (approximately 30 A's remaining), the 5’ cap is removed (a process called "decapping"), and the RNA is rapidly degraded. 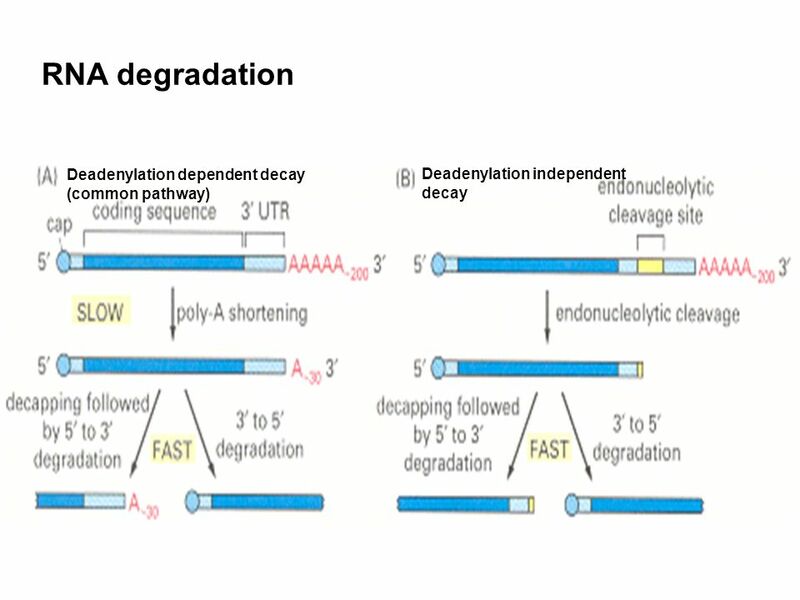 mRNA degradation begins with the action of specific endonucleases, which simply cleave the poly-A tail from the rest of the mRNA in one step. 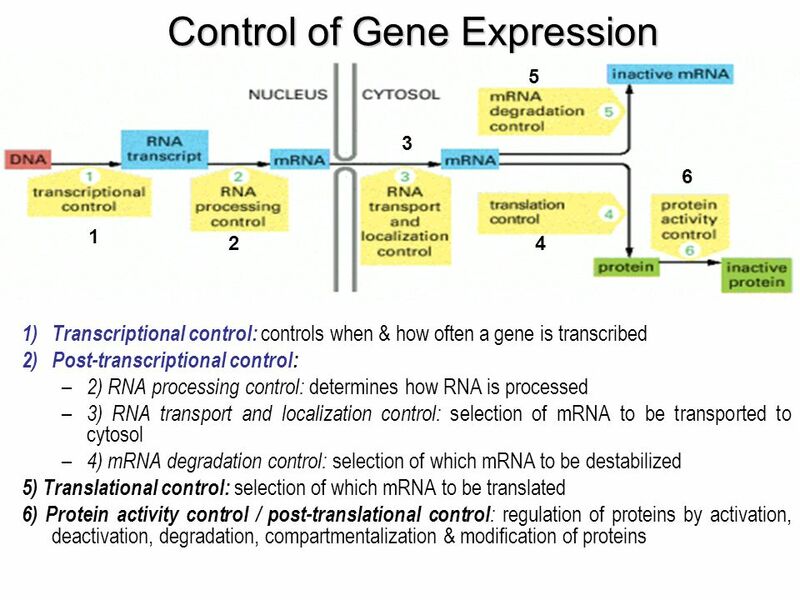 Download ppt "Control of Gene Expression"
CH. 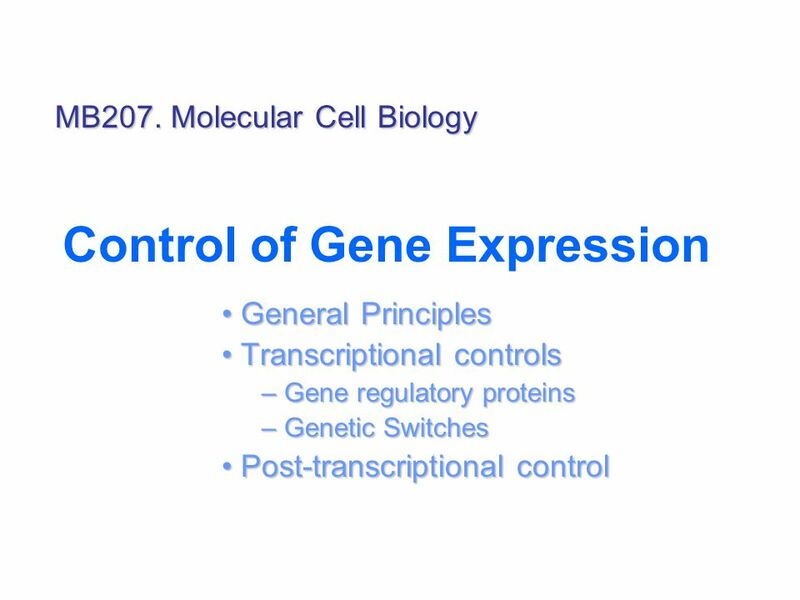 11 : Transcriptional Control of Gene Expression Jennifer Brown. Transcriptional-level control (10) Researchers use the following techniques to find DNA sequences involved in regulation: – Deletion mapping – DNA footprinting. 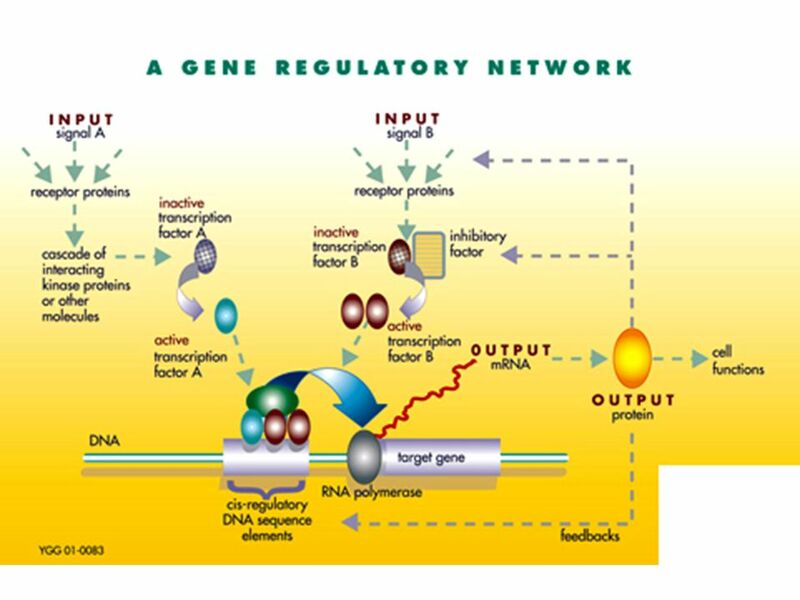 Regulation of gene expression Premedical - biology. Protein Synthesis Genome - the genetic information of an organism DNA – in most organisms carries the genes RNA – in some things, for example retroviruses. Gene Regulation Chapter 14. Learning Objective 1 Why do bacterial and eukaryotic cells have different mechanisms of gene regulation? Why do bacterial. 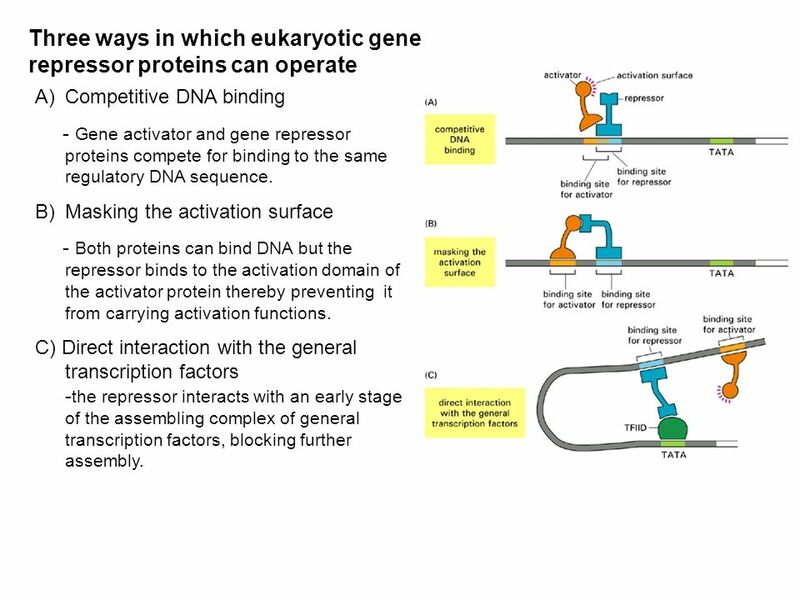 I. Overview of Eukaryotic gene regulation Mechanisms similar to those found in bacteria- most genes controlled at the transcriptional level Much more complex. 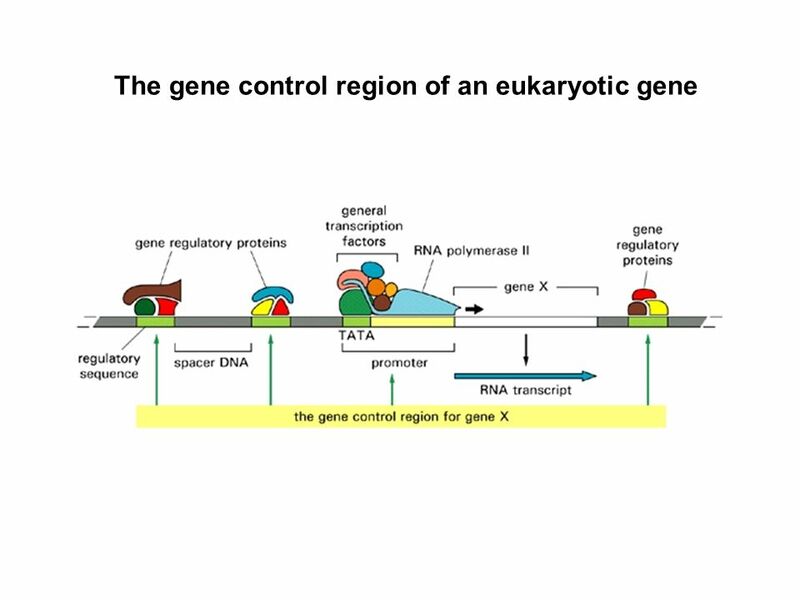 Gene Control in Eukaryotes In eukaryotic cells, the ability to express biologically active proteins comes under regulation at several points: 1. Chromatin. Day 2! Chapter 15 Eukaryotic Gene Regulation Almost all the cells in an organism are genetically identical. Differences between cell types result from. Essentials of the Living World Second Edition George B. Johnson Jonathan B. Losos Chapter 13 How Genes Work Copyright © The McGraw-Hill Companies, Inc.
REGULATION of GENE EXPRESSION. GENE EXPRESSION all cells in one organism contain same DNA every cell has same genotype phenotypes differ skin cells have.